“Practicing unilateral trade protectionism in the name of ‘national security’ and ‘fair trade’ will not only affect China’s economic development, but also undermine the external environment of India,” it continued. Both the U.S. and China have imposed an escalating series of retaliatory tariffs against each other over the past year, as President Donald Trump seeks to rebalance America’s trade deficit with China. Around half of Chinese imports to the U.S. have had ten percent tariffs imposed, while China has retaliated with tariffs on American goods worth with tariffs worth $110 billion. However, despite a rise in Sino-Indian trade over recent years, India also expressed frustration with China’s trade practices, especially with their non-tariff barriers against pharmaceuticals, IT products, rice, and meat that have led to a substantial trade deficit of $63 billion. On Tuesday, the International Monetary Fund reduced its world economic growth forecast for 2018 and 2019 to 3.7 percent based on the trade war’s impact on emerging markets. Ji went on to urge the U.S. against interfering in the ongoing diplomatic war between China and other countries staking claims over the South China Sea, where the Chinese military has expanded its presence over the past year. He also dismissed concern from the Trump administration about Beijing’s predatory lending practices. 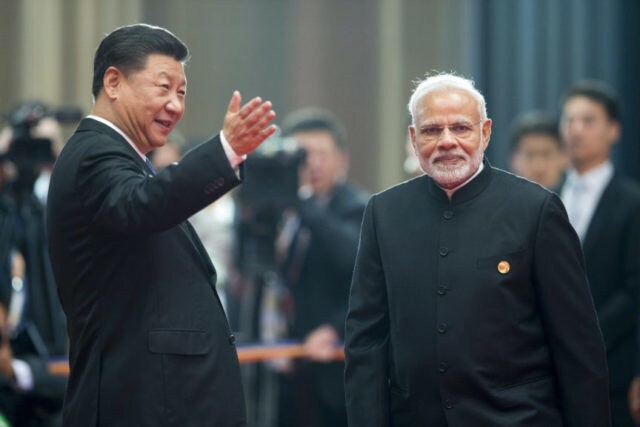 The meeting between Modi and Xi Jinping comes more than a year after China and India almost went to war over a territorial dispute over the Doklam Plateau, where both countries engaged in a military border standoff between the Indian Armed Forces and the People’s Liberation (PLA) after Beijing began constructing a road without approval from Dehli. The dispute ended last August after both sides agreed to disengage and withdraw their troops from the area.